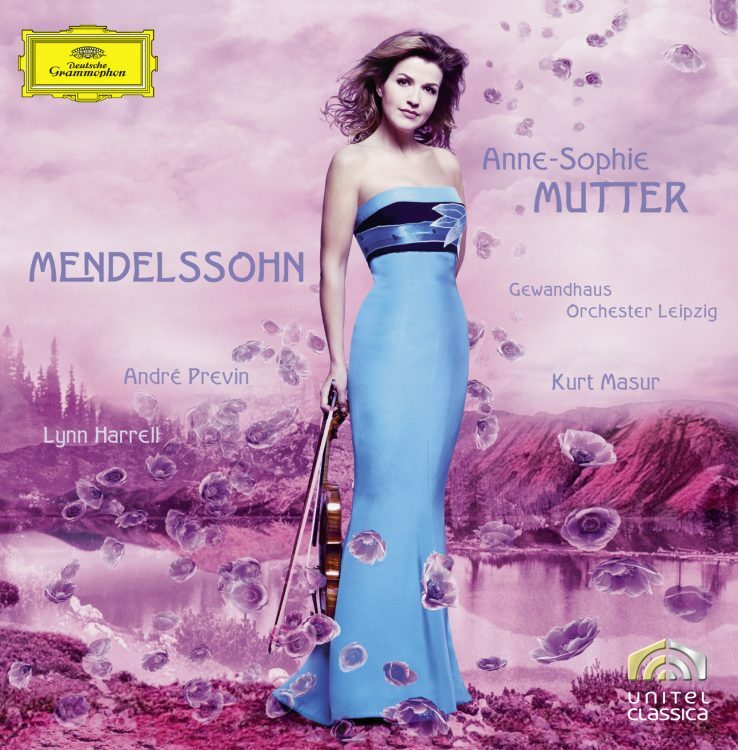 To mark the bicentenary of Mendelssohn's birth, Anne-Sophie Mutter has been honouring the composer with a very personal tribute combining symphonic music and chamber works on CD and DVD: The Violin Sonata in F major of 1838, the Piano Trio in D minor op. 49 that was completed in 1839 and the Violin Concerto in E minor of 1845, a work which even today has lost none of its fascination. Mendelssohn was born in Hamburg on 3 February 1809, the son of a wellto-do Jewish banker, but grew up in Berlin. A brilliant pianist, he was also a conductor and an impassioned chamber musician. Not infrequently he himself gave the first performances of his own works, and this was also the case with his Piano Trio op. 49. Anne-Sophie Mutter admires Mendelssohn for a number of reasons: "He was a man of many parts, but also one with many obligations and duties who showed great commitment to all that he did. His importance to the history of music is clear not least from the fact that he played a significant part in the Bach Revival. He was the baptized Jew who 80 years after Bach's death reintroduced the St. Matthew Passion to the whole of Europe and ensured its lasting popularity. Another of his great merits was his pronounced sense of social responsibility. It was in his keenness to ensure that a musical education was not just the luxurious preserve of members of the upper classes that he helped to set up the Leipzig Conservatory. He was also an eminent man of letters, with a fluent command of Italian, English and Latin, and, finally, he was a magnificent painter, who produced some wonderful watercolours." The E minor Violin Concerto received its first performance in Leipzig in 1845, when the soloist was the Gewandhaus Orchestra's concertmaster, Ferdinand David. The work was written with David in mind, and the solo part was in fact substantially influenced by him. 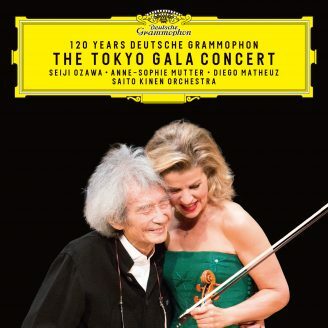 Anne-Sophie Mutter first recorded this work in 1980, at the start of her career, with the Berliner Philharmoniker under Herbert von Karajan. For her second recording she travelled to Leipzig, the scene of the work's first performance, where Ferdinand David led the Gewandhaus Orchestra for more than 30 years. Even though the original Gewandhaus building no longer exists, there is still a Gewandhaus Orchestra that can look back on a long and distinguished tradition and that worked regularly with Mendelssohn between 1835 and his death in 1847. More recently, its music director was Kurt Masur, whose 26-year tenure is fondly remembered by Anne-Sophie Mutter. In particular she recalls "the transparency and elegance of the sound and the understanding of the need for an inner balance", for the musicians "not only play together, they also feel together and breathe together". Her work with Kurt Masur is "a bit like flying", a comment prompted by an experience that the virtuoso violinist recently had with Masur and the New York Philharmonic: "We were recording the Beethoven Violin Concerto and had reached a passage in which the orchestra needs to listen and accompany. Masur said: 'Just let her fly! ', which is exactly what I feel when I play Mendelssohn, for example, with Kurt Masur. Especially in a concerto that involves so much tempestuous and propulsive passion." For Anne-Sophie Mutter, this "Sturm und Drang" element in Mendelssohn's music is extremely important, not least in the Violin Concerto: "It is striking that the performance marking appassionato occurs very often in Mendelssohn's output, not only in the opening movement of the Violin Concerto but also in the final movement of the Piano Trio." This sense of urgency and vitality also inspired her interpretation of the slow movement of the Violin Concerto, an interpretative decision for which she received decisive encouragement from Kurt Masur, who drew her attention to the Venetianisches Gondellied op. 57 no. 5 of 1842: the same accompanying figure is found in the piano part here as in the orchestral writing in the concerto. "Central to the gondolier's song is his wish to flee with his lover, it is all about burning desire and this youthful sense of impulsiveness", placing considerable demands on the interpreter, who is required "to combine purity of expression with the impatience of Mendelssohnian passion". The violinist regards the concerto's final movement as "entirely typical of Mendelssohn", a kind of elfin dance similar to the one that he devised for his Octet op. 20 of 1825 and that he repeatedly used in his later quick movements and scherzos. "This scurrying, gossamery, ghostly element is enormously virtuosic, its lightness of tone representing a real challenge for the interpreter." Anne-Sophie Mutter believes that the success of the Violin Concerto is grounded in the music itself, "which combines everything that constitutes great music: passion, virtuosity, purity of expression, depth of emotion and an unconditional surrender to the musical expression. It is a stroke of genius, and this music is immortal." Like the E minor Violin Concerto, the F major Violin Sonata of 1838 was written for Ferdinand David. This demanding three-movement work by the mature composer is notable for the impassioned and raptly triumphal tone of its outer movements, while its central Adagio is a captivating dialogue between violin and piano. The work's genesis suggests in fact that Mendelssohn struggled long and hard to resolve various compositional and, above all, technical details in the violin part. Although he played through the piece with Ferdinand David, he made little progress on revising it, his alterations being limited to the opening movement. Possibly his manifold artistic obligations as a soloist and conductor and his often extended and exhausting concert tours simply left Mendelssohn with no time to undertake a final, thorough revision of the piece. As a result, there is no authorized version of the sonata, which remained unpublished during its composer's lifetime. Not until 1953 did Yehudi Menuhin publish a version based on the initial draft and on the revisions to the opening movement, and this remains the only edition of the work. It is also the one used by Anne-Sophie Mutter: "There's no doubt that it's an authentic piece, but one that was not fully revised by Mendelssohn. Many other great works, including the 'Italian' Symphony, for example, suffered the same fate. It would be an immeasurable loss if these works were not performed." Completed in 1839, the Piano Trio in D minor op. 49, conversely, was not only published during Mendelssohn's lifetime but was also held in high regard. It was first performed in Leipzig on 1 February 1840, when the performers were the composer himself on the piano, Ferdinand David on the violin and Carl Wittmann on the cello. A profound and substantial piece, it was described by Robert Schumann as "the master trio of the present day", a work that "will delight our grandchildren and great-grandchildren". Anne-Sophie Mutter shares Schumann's enthusiasm: "For some time I have been absolutely wild about Mendelssohn, and this is palpable in the Trio." 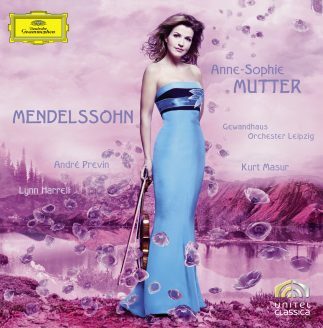 The opening movement is an animated and elaborate Molto allegro that is followed by a songlike Andante and by what Anne-Sophie Mutter describes as a "breathtakingly virtuosic Scherzo that strikes a note both elegant and playful", its scurrying elfin strains recalling the incidental music to A Midsummer Night's Dream. The work ends with a thrilling rondofinale. The first of Mendelssohn's two completed piano trios, the present piece is notable for its successful balance between melody, harmony and translucency. The piano part is clearly more weighty and more independent than the parts for the two string instruments, with which it acts as a foil: the writing in general aims not to create a sense of integration between the three instruments, as is the case with Beethoven's piano trios, for example, but to establish a sense of contrast between the piano on the one hand and the strings on the other. In André Previn's hands, the independent piano part, bearing the weight of the musical argument, is contrasted with the interplay of equals between Anne-Sophie Mutter and Lynn Harrell, a partnership typified by "spontaneity and a multiplicity of tone colours". All three players achieve a sense of balance by dint of a premise that is by no means self-evident: "We trust each other, listening to one another and performing as of one mind."